The lens cap that comes supplied with the Voigtländer Color-Skopar 20mm SL II does not fit, when you have the LH-20 lens hood and a filter on. What a dumb design oversight. 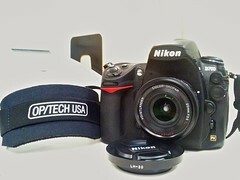 However, if you get a Nikon LC-52 52mm lens cap, that fits right in there, no problem. Nice. I like the design of the Nikon caps better than the Cosina Voigtländer or Carl Zeiss ones anyway. Easy to grab and avoid getting my paw prints all over the lens. I hope this helps any owners of the tiny high-performance Voigtländer Color-Skopar 20mm SL II. Enjoy!